The study involved more than 300 primary school children in Bradford, West Yorkshire, in the United Kingdom. Experimenters under the supervision of Mark Mon-Williams, Professor of Cognitive Psychology at the University of Leeds, had the children, who ranged in age from 4 to 11, take part in computer tasks to measure their coordination and interceptive timing (their ability to interact with a moving object). The tasks that measured eye-to-hand coordination involved steering, taking aim, and tracking objects on a computer screen. In the ‘interceptive timing’ task, the children had to hit a moving object with an on-screen bat. This task taps into the brain’s capacity for predicting the movement of objects through time and space, which is a fundamental cognitive ability. 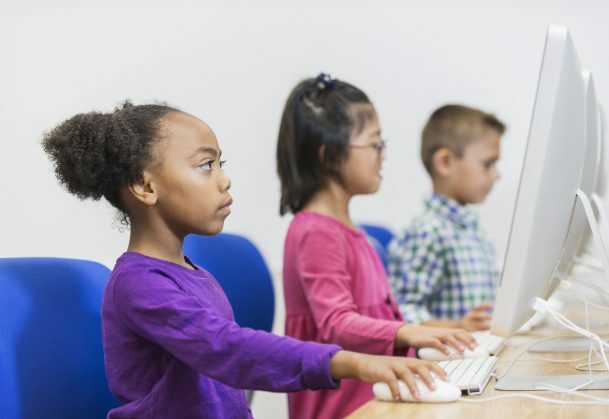 After controlling for age, the researchers found that the children who performed better at the eye-to-hand coordination tasks tended to have higher achievement scores in reading, writing, and mathematics, based on national academic standards. Those who performed best at the ‘steering task’, in particular, averaged 9 months ahead of classmates who struggled with that eye-to-hand measurement. While the children’s interceptive timing skills tended to predict their attainment in math, it had no influence on reading and writing development, the researchers found. The study doesn’t demonstrate a direct cause and effect, but identifies a significant association between the ability to process physical surroundings and events and educational attainment, the authors say. This research builds on recent scientific findings suggesting that the ability of babies between the ages of 6 months and 13 months to understand the world around them affects their ability to manipulate numbers when they reach age 4. “The current thinking among psychologists is that the neural circuitry used to build up a child’s understanding of their external environment, the way they orientate themselves spatially and understand their world, is also used to process numbers and more abstract thinking,´ Mon-Williams says. “It also raises the question: should schools be identifying those children who are seen as clumsy or not so well coordinated and giving them extra support? Lilycroft Primary School, the Bradford school where the study was conducted, is applying the findings. The school has remodeled its reception, indoor, and outdoor areas to include a space where children can develop their motor skills and their ability to call on large muscle groups to coordinate movement. The research was funded by the Medical Research Council and the Economic and Social Research Council. It was conducted as part of the Born in Bradford project, a large study examining the health and well-being of 13,500 children born in the city, which has high rates of poverty and childhood illness. This information fits with research in the sixties about sensory-motor work significantly Improving IQ. Edgar and Kephart were leaders in this research. I feel that it was not believed and lost. This study lends support to the use of test batteries for evaluating children which include measures of eye-hand coordination. This is what Maria Montessori discovered 100 years ago following years of observing children. In a Montessori classroom children interact with materials from a young age, developing fine and gross motor skills and preparing for future understanding of mathematical concepts.